Mahindra had officially launched the new XUV 300 in India last month. 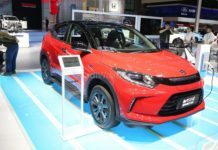 The XUV300 comes in 4 variants and this compact SUV is based on Ssangyong Tivoli’s X100 platform but the company has reduced the length to get excise duty benefits, and it is going to compete for head-on against the segment best-seller Maruti Vitara Brezza. 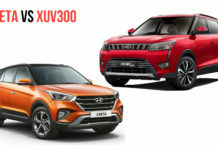 Does the Mahindra XUV 300 offer enough to displace the Maruti Suzuki Vitara Brezza from the top spot? 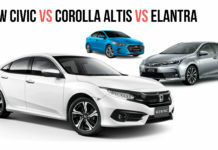 Here is a detailed spec comparison that will tell you more about it. The XUV300 comes in four variants – W4, W6, W8 and W8 (O). 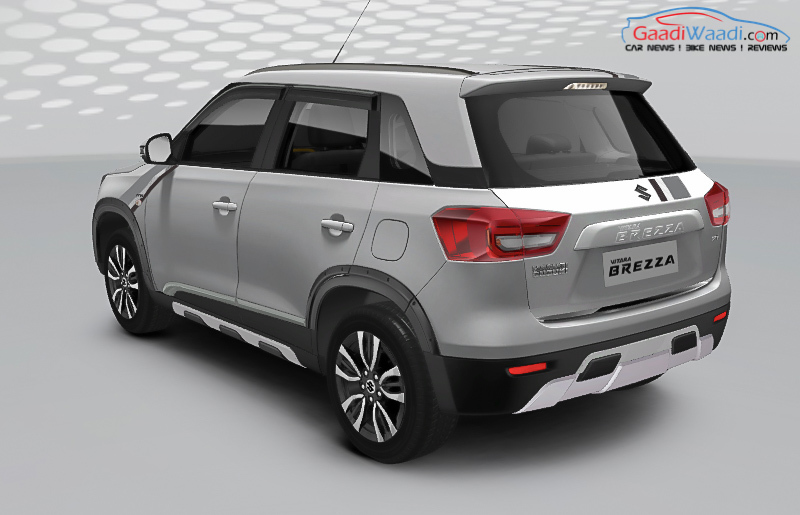 Like the XUV 300, Maruti Suzuki is also offering the Vitara Brezza in four variants – LDi, VDi, ZDi and ZDi+. The entry-level LDi diesel variant of Vitara Brezza is priced at Rs. 7.84 lakh while the XUV300’s base diesel is priced at Rs. 8.49 lakh. 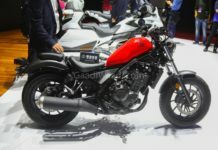 The latter offer more features on the base variant and has the advantage of having petrol engine whose price start at Rs. 7.9 lakh. 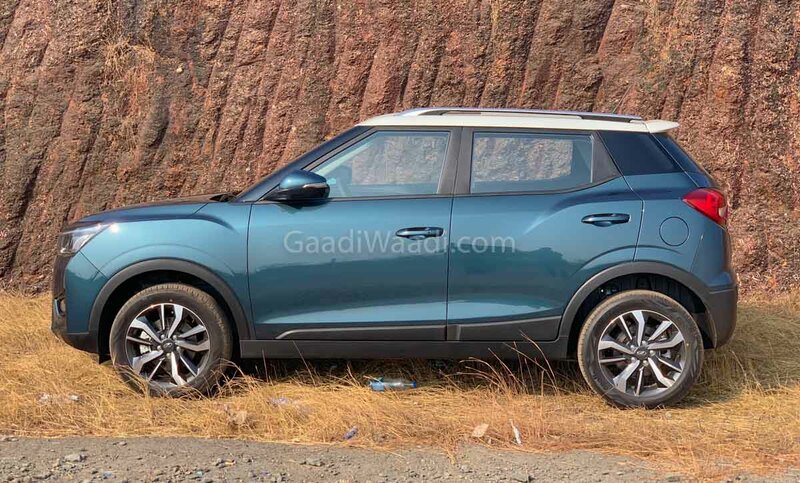 But Mahindra is not yet offering an automatic transmission with XUV 300 and it is expected to be introduced soon as the Vitara Brezza comes with AMT gearbox option. The price gap between both models increase as VDi variant of Vitara Brezza is priced at Rs. 8.5 lakh compared to Rs. 9.30 lakh for the W6 variant of XUV 300. Mahindra XUV300 is the first model in its segment to come with 7-airbags, four disc brakes, 17-inch alloy wheels, dual-zone climate control, three different steering modes (Normal, Comfort and Sport), front parking sensors, passenger airbag off switch, seat belt reminder for all passengers, heated exterior mirrors, electric sunroof and more. The ZDi variant of Maruti Vitara Brezza has priced at Rs. 9.12 lakh, which is much lower than Rs. 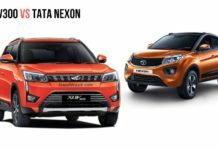 10.80 lakh for the W8 variant of XUV 300. The price difference between the top end variant of Vitara Brezza and XUV300 is around 2 lakh as the former is priced at Rs. 10.06 lakh and Rs. 11.99 lakh for the latter. Mahindra offers both petrol and diesel engine options with the XUV 300 in the Indian market. It is powered by an all-new 1.2-litre turbocharged petrol engine that develops a maximum power 110 Bhp and a peak torque of 200 Nm. 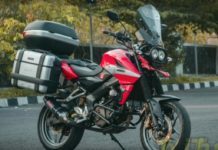 This is the first time that a Mahindra vehicle sells a turbocharged petrol engine in the Indian market. Well, when it comes to Maruti Suzuki Vitara Brezza, there is no petrol engine on offer. A diesel engine only powers the Brezza. The Maruti Suzuki Vitara Brezza is powered by a 1.3-litre Multijet diesel engine that produces a maximum power of 89 Bhp and a peak torque of 200 Nm. The diesel engine of the Maruti Suzuki Vitara Brezza produces the same torque as the petrol engine of the Mahindra XUV 300. The Mahindra XUV 300 also gets powered by a 1.5-litre diesel engine that also powers the Mahindra Marazzo in the market. The engine has been re-tuned for the Mahindra XUV 300, and it now produces a maximum of 115 Bhp of maximum power and 300 Nm of peak torque. The XUV 300 gets a 6-speed manual transmission with both the petrol and diesel engine options. The Maruti Suzuki Vitara Brezza offers a 5-speed manual transmission as standard and also provides a 5-speed AMT automatic transmission. 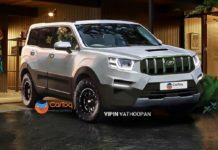 The Mahindra XUV 300 does not provide an automatic transmission yet, but it is expected to be launched later this year. 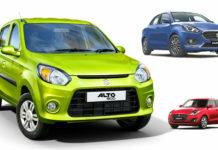 Coming to the mileage, the Maruti Suzuki vehicles have always remained the king in the market. 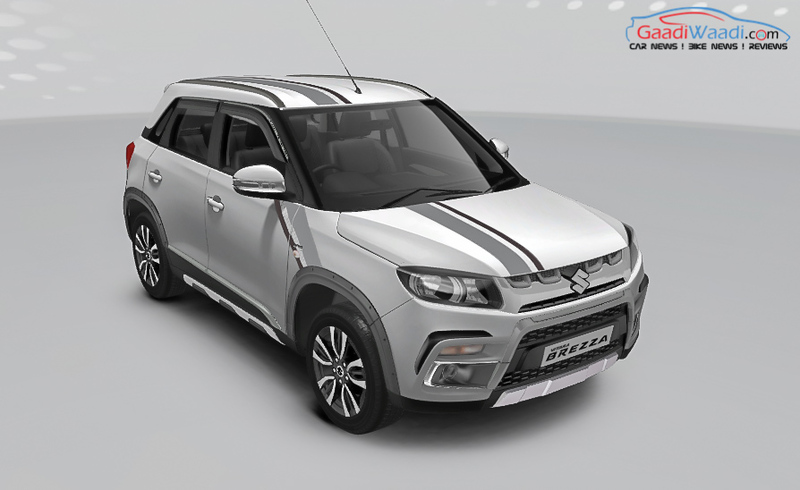 The Maruti Suzuki Vitara Brezza is no different. The Maruti Suzuki Vitara Brezza offers a phenomenal fuel efficiency of 24.3 km/l as per the ARAI certificate. 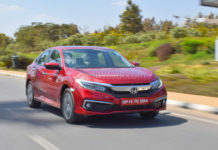 It is the most fuel efficient vehicle in the segment. The much more powerful Mahindra XUV 300 offers a maximum fuel efficiency of 20 km/l with the diesel engine. The petrol versions of the Mahindra XUV300 provides a maximum fuel efficiency of 17 km/l. 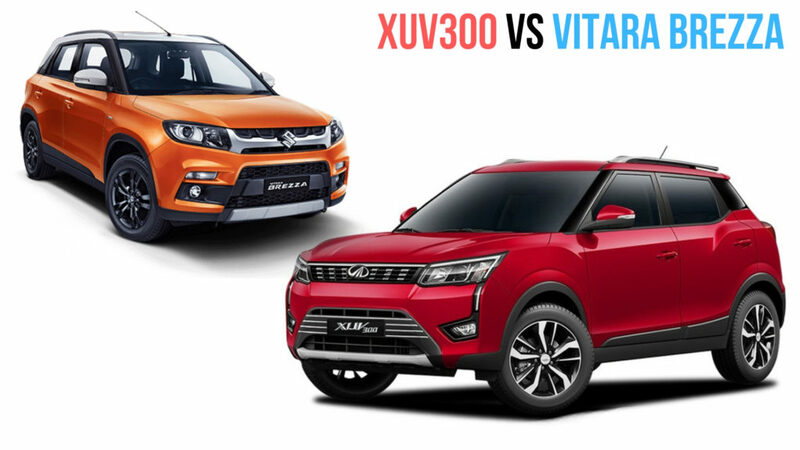 Both Mahindra XUV 300 and the Maruti Suzuki Vitara Brezza are sub-4m-compact SUV. 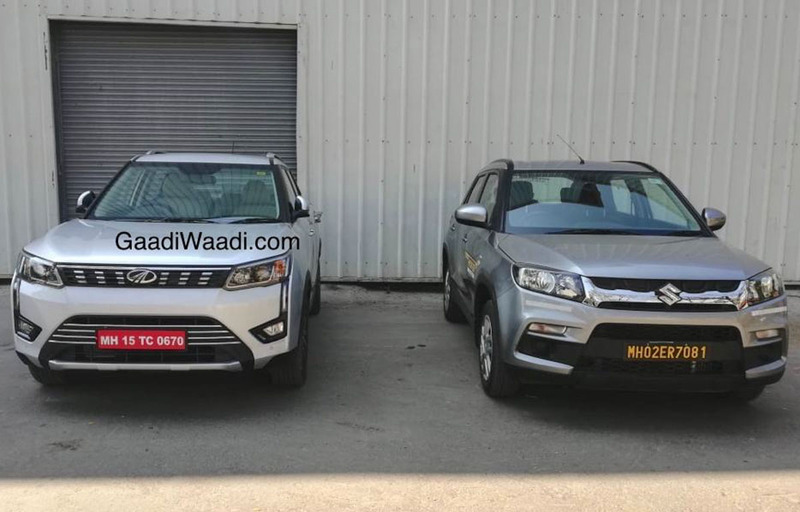 However, the Mahindra XUV 300 is slightly larger than the Maruti Suzuki Vitara Brezza. The Maruti Suzuki Vitara Brezza offers 3,995mm of length, 1,790mm of width and 1,640 mm of height. It provides a wheelbase of 2,500mm. Mahindra XUV 300 comes with 3,995mm of length, 1,821mm of width and 1,617mm of height. 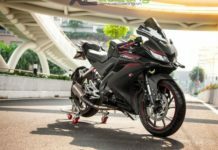 It offers the segment-leading wheelbase of 2,600mm. 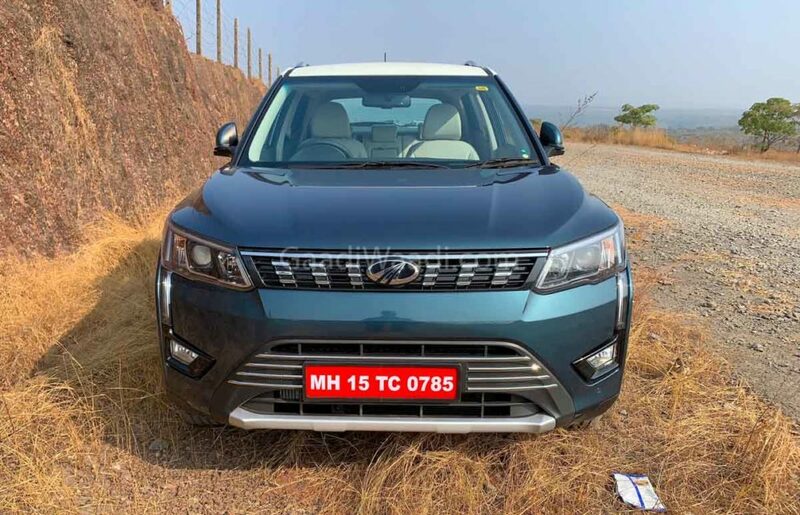 There is a difference of 100mm in the wheelbase, which means that the Mahindra XUV offers a larger cabin space and shorter overhangs, which will make it handle the rough roads in a much better way as it offers better approach and departure angle. 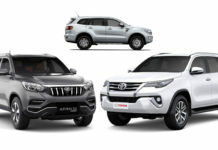 The Mahindra XUV 300 looks quite similar to the newly launched Mahindra XUV 500 facelift and the Mahindra Alturas, thanks to the chrome-dipped grille in the front. It gets a unique identity because of the LED DRLs integrated to the large headlamps at front. The XUV 300 also gets its share of the rugged looks with the help of cladding all around the body. There is a black cladding the surrounds the vehicle. At the front, it gets a chrome skid plate which is also present in the rear. The window line of the XUV300 is most interesting. It gets an upward kink at the end of the rear window, which adds a modern touch to the design. The thick, C-Pillar of the Mahindra XUV300 is painted in gloss black, which adds a floating roof effect. Mahindra also offers 17-inch machined alloy wheels, that further makes the Mahindra XUV 300 look very attractive. 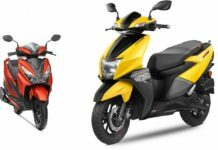 Now coming to the Maruti Suzuki Brezza, it has been specifically designed for the Indian market and gets a simple, no-nonsense design. 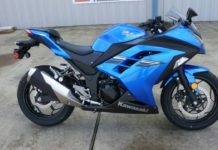 It gets a thick chrome-dipped grille at the front with the Suzuki logo on it. The Vitara Brezza also gets LED DRLs but they are not very visible and are ignored most of the times. The Vitara Brezza also gets faux chrome skid plates at the front and rear. From the side, the Vitara Brezza looks very simple with a straight window line and regular-looking alloy wheels. 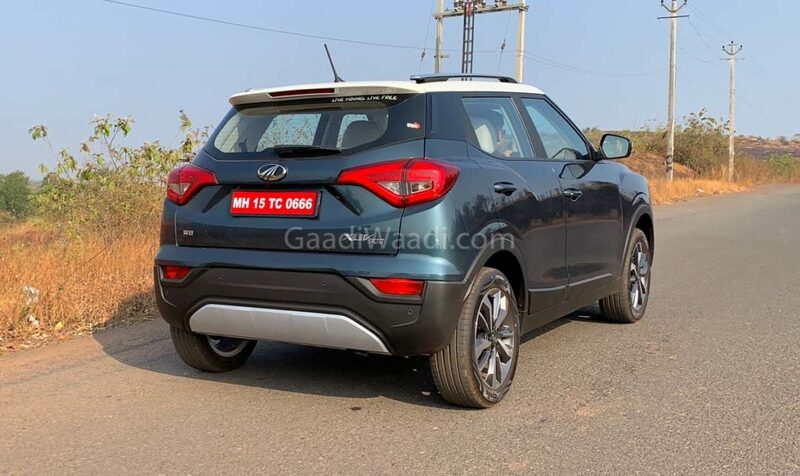 Both XUV 300 and the Vitara Brezza get split tail lamps at the rear, which are almost similar in shape. 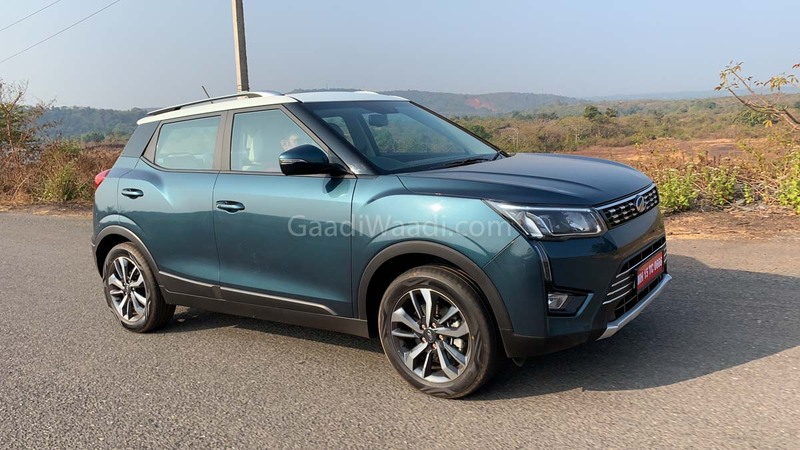 Both of them also get roof rails but the XUV 300’s rails are much more prominent and positively adds more bulk to the overall design of the car. Coming to the colour, the top end of the Vitara Brezza offers dual-tone body colours. It gets a contrasting roof colour, which makes it look quite different and attractive on the roads. The Mahindra XUV300 does not offer any such dual tone colour schemes but with the blacked out pillars, the floating roof effect looks very good on the Mahindra XUV 300. 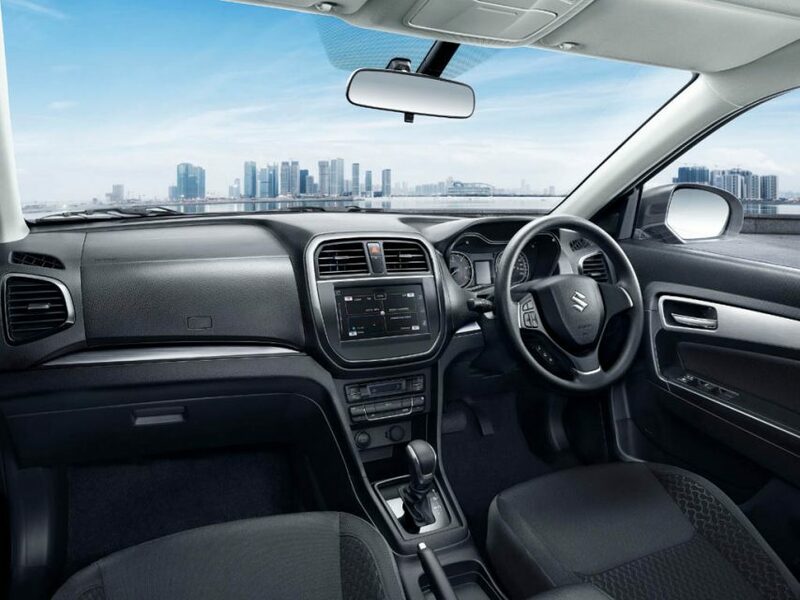 Maruti Suzuki Vitara Brezza gets an all-black interior with touchscreen infotainment in the middle, Even the driver console is quite simple and effective. It gets a twin-pod instrument cluster with a monochrome Driver Information Display. 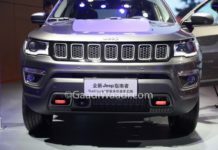 It also gets steering mounted controls and safety features like dual airbags and ABS+EBD as standard. The Mahindra XUV300 looks very sophisticated when it comes to the features. It gets dual-tone interiors with leather trims. It also gets a touchscreen infotainment system in the middle with controls below it. 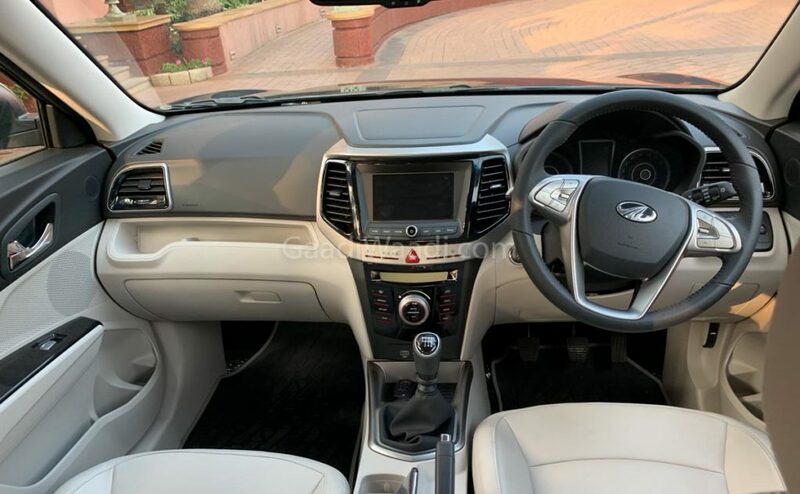 The dashboard of the Mahindra XUV 300 looks well spread out. It also gets a higher number of features including 7-airbags, dual-zone climate control, longer cabin space and more. In the pictures, the Mahindra XUV 300 definitely gets a plusher cabin. The Mahindra XUV 300 also gets a coloured Driver Information Display, which is again the first-in-segment feature. Apart from these, Mahindra will load the car with features like a sunroof and more. The Maruti Suzuki Vitara Brezza does not offer any fancy features. 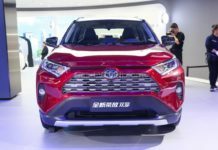 It comes with features like a leather-wrapped steering wheel, projector headlamps, touchscreen infotainment with Android Auto and Apple CarPlay, dual airbags and ABS+EBD. The Mahindra XUV 300 gets a long list of features, out of which many functions are first in the segment. The XUV 300 comes with disc brakes on all four wheels, dual-zone automatic climate control system, steering modes, projector headlamps, 7-airbag system, ABS+EBD, sunroof, tyre pressure monitoring system, front and rear parking sensors, reverse parking camera, heated wing mirrors, idle stop/start system, leather seats, leather steering wheel, cruise control, touchscreen infotainment system and more. The Mahindra XUV 300 offers a loaded cabin that feels much more premium and plusher when compared to the Maruti Suzuki Vitara Brezza. 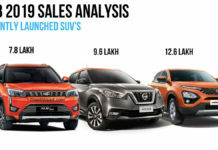 It also gets more powerful engines and a much more intimidating look however price will play a big role in the success of the Mahindra’s latest SUV.